Roman blinds are usually made with a blockout lining and are great for bedrooms and living areas. They can also be made in sheer fabrics, with or without battens. We offer a variety of custom made styles and practical options to ensure you receive a blind perfectly suited to your design needs. This versatility, combined with today's beautiful fabrics, means that we can deliver custom made Roman Blinds to suit every decor. Roman blinds are specialized product, it is recommended to seek professional advice on fabric selection to determine the suitability. Select from a wide range of fabrics and finishes available in our showroom in Warrandyte. At Interiors by Riveresque we offer a cord and pulley system, a cord lock system, chain operation, and a motorised operation system. 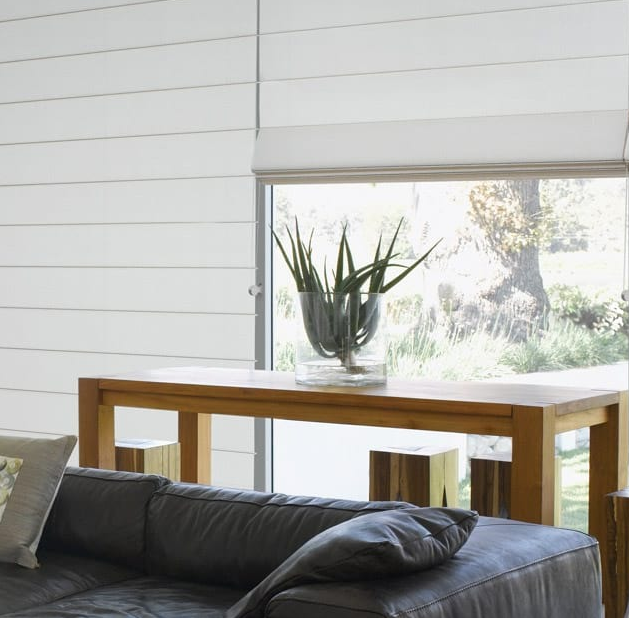 Another option are Luxaflex' Modern roman Blinds – where the blinds roll up into the head box. Operation system includes easy rise, or powerview battery and hardwired options. See the Luxaflex range here.